Even the fisherman sculptures by Greg James in the Fremantle Fishing Boat Harbour are celebrating International Women’s Day. They put skirts on. WOMEN HAVE A RIGHT TO EQUALITY! It is INTERNATIONAL WOMEN’S DAY today, so here a small tribute to all women around the world, especially those who still have to fight for basic rights and equality. It is also a tribute to my very strong mother Annie and my equally strong sisters Marja, Bep and Anita. I was amazed to learn last night on Q&A on ABC TV that women and girls in Australia still earn substantially less than men, even at executive levels where men on average receive $ 100,000 a year more than women in similar positions. It was also a surprised to learn that often girls receive less pocket money from their parents than their brothers do. It’s time to let go off gender discrimination as it is ridiculous. Women rock! Comments Off on WOMEN HAVE A RIGHT TO EQUALITY! 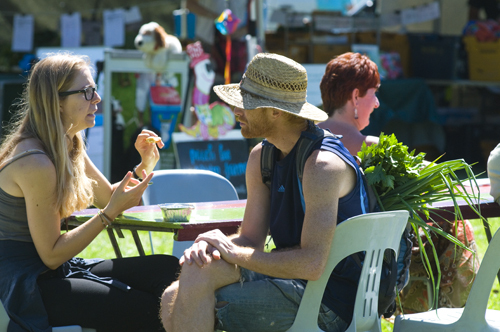 The Fremantle GROWERS GREEN FARMERS MARKET will be celebrating International Women’s Day this Sunday with special female performers Natalie Gillespie, accompanied by Dave Brewer, and Donna Simpson of The Waifs. It will be a morning of great music and fantastic fresh produce in celebration of the special role women play in our society. So all you grandmothers, mothers and daughters go out to the Growers Green and feel yourself embraced by the rest of the community! The market is on from 8 am till 12 noon at the South Fremantle Senior High School on Lefroy Road, Beaconsfield.